Clark Royce was born perhaps about 1786. He was the son of Josiah Royce and Lucy Baldwin. Mary E. Beach & Helen Beach, The descendants of Thomas Beach of Milford, Connecticut, , at https://archive.org/stream/descendantsoftho00beac . Hartford, Conn.: The Case, Lockwood & Brainard Company, (1912) , p. 7. 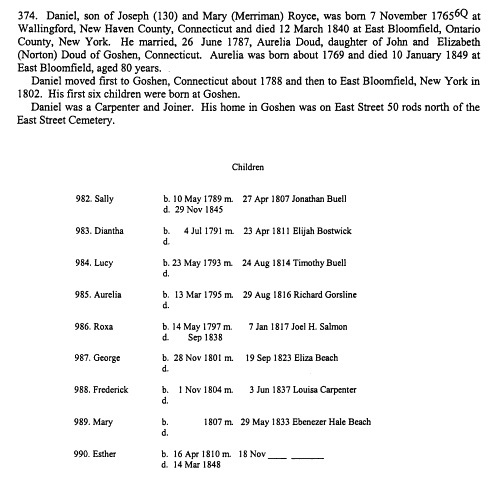 "Connecticut Births and Christenings, 1649-1906," database, FamilySearch (https://familysearch.org/ark:/61903/1:1:F7W2-TS4 : accessed 2 September 2015), Dinah Royss, 24 Feb 1696; citing ; FHL microfilm unknown. Peter Haring Judd, Four American Ancestries: White, Griggs, Cowles, Judd, Including Haring, Phelps, Denison, Clark, Foote, Coley, Haight, Ayers, and Related Families, , at https://books.google.com/books?id=zAV98m0cyl4C . New York, NY: Peter Haring Judd, (2008) , Vol. 3, p. 507. Ellwood Count Curtis, The descendants of Josiah Churchill (c. 1615-1686) and Elizabeth Foote (1616-1700), , at https://books.google.com/books?id=5AoZAQAAMAAJ . Galactic Press, (2008) , p. 81.